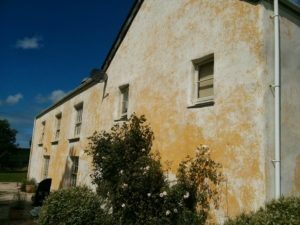 This is a tale of how the more expensive Beeck Mineral paint should turn out cheaper in the long run than a low cost limewash. 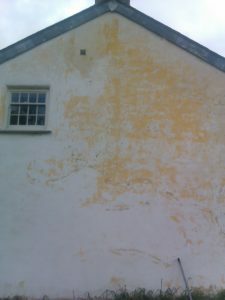 The owner of this large farmhouse wanted to cover up the strong yellow colour limewash with an off-white limewash, and employed a painter to carry the work out. 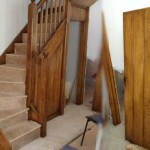 A whole summer and several coats of limewash later, the job did look finished. This pictures were taken less than a year after the wall was painted. A combination of lack of preparation, and not understanding how limewash works, has meant that rain has washed most of the new limewash off again! 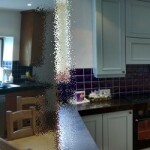 The close up view on the right shows not only the new, but also the old layers have come away from the render. Limewash is not the most durable finish for an exterior, but done properly, should last longer than this example. However, the property owner was losing confidence with “breathable” finishes, and asked me for a recommendation on how to fix the problem. A large proportion of the property is built from Cob, a traditional rammed-earth construction technique. It’s important that moisture is allowed to escape from this material, so I absolutely ruled out masonry paint, and suggested we either re-do the limewash – properly this time – or use a mineral paint. 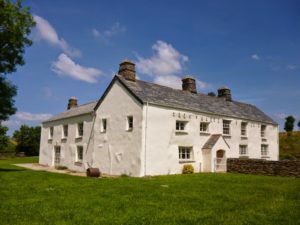 The high cost of mineral paints had led to the decision to use the cheaper limewash in the first place, but now that most of it had washed off over the winter it was not looking so cheap after all. I argued that the higher material costs with mineral paints would be off-set by lower labour costs (3 coats as opposed to 4+ for lime), and durability (around 10yrs Vs 3 for lime). 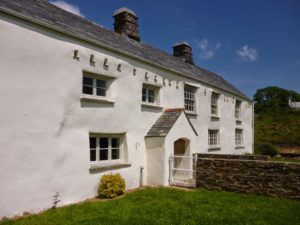 We agreed a test redecoration of a gable-end wall, as it was the most weather-prone and flaked off part of the farmhouse, and leave it over the winter to prove that it will be durable enough to justify the outlay of painting the whole property in the same system. Beeck mineral paint from Cornish Lime was chosen for its good value and ready availability. The success of the gable-end wall meant that in the following year we could proceed with the rest of the house…..And much algaecide, power-washing, scraping and scrubbing later, we had a reasonably firm substrate to apply a coating to. Because the surface was a bit rough, especially where lots of layers of limewash had flaked off, we went with Beeck Quartz Filler. It’s a thick porridge-like stuff, which contains an aggregate, that is thinned with this system’s universal “thinner” – Fixative. The Fixative makes the stuff easier to apply, but also soaks into the old limewash a bit to consolidate it. Quartz filler is fantastic stuff, (albeit a bit pricey), because like textured masonry paint it smooths out the lumps and bumps and the aggregate texture hides surface imperfections. 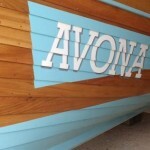 It also covers really well, and after one coat it had all but covered the strong yellow. After that, it was two coats of the Beeckosil in a light cream colour – again thinned with fixative – and voila: a really solid surface that should last in well excess of 10 years. Beeck Mineral paint is not a cheap system. Unusually for a painting job, the material cost was significantly more than the labour cost, but the longevity of the result should compare favorably with re-doing limewash every three years. 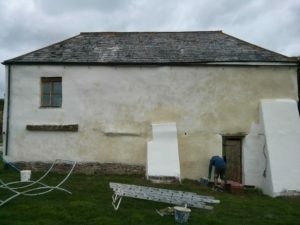 Whilst we were there, we did redo the limewash on two small cob barns on the property, so it will be interesting to see how they fare in years to come.